We have registered the brand in the United States Trademark Office!!! Notice: Only sell from Mon Art!! Hi-Q: High quality artwork, printings on high quality canvas. Decor: A perfect choice for wall decorations, home decorations and office decorations. Oil-Hand paintings: The edges of every painting are painted and the surface is covered with clear plastic film layer to protect the painting. Print-paintings: the surface is Not covered with clear plastic film layer, For Your Attention! convenience: Framed and Ready to Hang, No additional framing required. Paintings are Packed in Carton Box. Unframed need framed by yourself, and it packed in tube. Please be noticed that the size of each painting is clearly shown in the features, measure your area before purchase so that you can have an appropriate conception on the comparison of the painting size and your area. 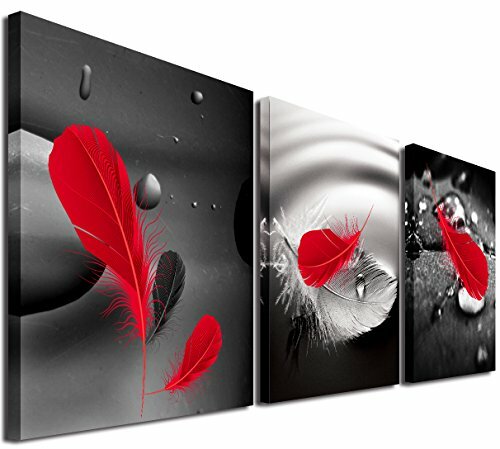 Canvases are exceptionally durable and can be cleaned with a soft, dry or slightly.and your area. Canvases are exceptionally durable and can be cleaned with a soft, dry or slightly. 12X12X3pics,Inch(30cmx30cmx3pics) total 3pieces. Prints on Canvas,The painting only sell by "Mon Art"
Hi-Q: High Definition Giclee artwork, printed on high quality canvas.Framed and Stretched. If you have any questions about this product by Mon Art, contact us by completing and submitting the form below. If you are looking for a specif part number, please include it with your message.